Fifteen years back in India, nobody had imagined that Tattooing or “getting inked” would become a fashion statement. Not that it was new to India; it was present in different forms in various parts of our country. Those who have observed ancient paintings or carvings on the walls of the caves done by tribes would have seen similar patterns on the body parts of these tribes, which are in the form of tattoos. It was most prevalent in tribe inhabited areas like Chhattisgarh, Jharkhand, Odisha, West Bengal, and North Eastern states. This form of art was also popular in South India, amongst the tribes of Tamil Nadu. In the Hindi belt, it is known as ‘Godna’ or ‘Gudna’’ whereas in Southern India it is known as ‘Pachakotharathu ‘. In the western world, it was earlier donned by miners, laborers, cult followers, however, who can forget Harley Davidson bikers with tattoos all over. Its popularity grew when cine artists and famous sports persons started sporting it. A tattoo is a painting, sketch or writing on body parts. They are permanent in nature. The basic process involves the penetration of ink, dye or pigment into our skin with the help of a needle. 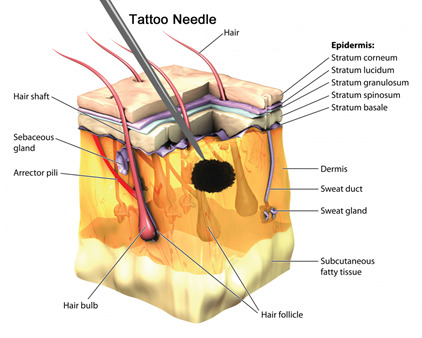 The ink enters that layer of the skin which is known as Dermis. The Epidermis is the outer most surface of the skin, which has sweat pores. The dermis is located just below Epidermis. It is the layer where the roots of our skin hair and sweat glands are located. Hence, when the ink of the tattoo enters, it stays there. When tattooing is done manually, the skin is punctured with needles and the ink is injected by hand. However, nowadays almost all the professional tattoo artists use Tattoo machines, also known as Tattoo guns. They are the rotary type or coil type with the ability to draw lines or shade or both. Tattoos do look attractive on many and it is gaining its popularity day by day. However, while its short-term effects like skin rashes and allergy against a particular color have been noticed, its long-term effects have not been studied carefully. Therefore, the need of the hour is to carry out studies on the long-term effects of various pigments entering our body in the process of tattooing. Places like Bangkok and Goa became the Mecca for Indians who wanted to sport Tattoos. Now the scenario is different. Every city has hundreds of tattoo parlors. The chic ones are now called studios. Did you know what went into your skin with the Tattoos? If one were to ask this question from the tattoo enthusiasts, their responses would be in negative, because, although this form of art has been in existence for quite some time in the USA and European countries, there is no formal monitoring or control. The scenario in India might be even more questionable. Many artists buy standard colors and pigments, however, many of them make their own colors too. 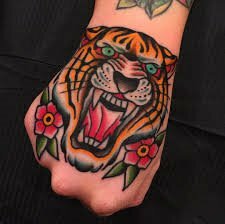 The colors in the tattoo inks are mostly obtained by dissolving heavy metals in a solvent or carrier, which is a chemical. Few examples worth citing here would be, using Mercury for red; Lead for yellow, green, and white; Cadmium for red, orange and yellow; Nickel for black; Zinc for yellow and white, so on and so forth. Few colors are obtained from organic substances too. These are azo chemicals that produce orange, brown, yellow, green and violet colors. Some pigments include Antimony, Arsenic, Beryllium, Lithium etc. In nutshell, one can firmly confess one’s little knowledge about the quality of ink he or she is allowing entering their skin. Conversely, many tattoo artists have started using nontoxic inks after having realized that inks with heavy metal content may affect the humans in long term. Of the various tests available, PET CT scan is considered to be the best test method to detect and analyze the abnormal growth of any tissues in our body. Positron Emission Tomography (PET) fused with Computed Tomography (CT) uses small amounts of radiotracers (the radioactive substance), a special camera and a computer access to analyze the functions of any tissue or organ. PET is capable of detecting the disease in the early stages, even before it is detected and identified by other tests. 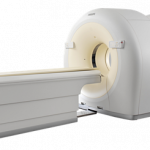 Various studies have shown that PET CT scans when compared with MRI, are very specific and sensitive towards the detection of cancer cells in lymph nodes assessing the metastatic status. Checking if cancer has spread to other parts of the body. Evaluating the productiveness of a treatment plan, such as cancer therapy. Checking if cancer has returned after or during treatment. Determination of flow of blood to the heart muscle. Determination of the effects of a heart attack or myocardial infarction on the heart. Identification of the heart muscle which can benefit from angioplasty or coronary artery bypass surgery (with the assistance of myocardial perfusion scan). Detection of tumors, memory disorders, seizures and central nervous system of the brain. Mapping of a normal human brain and heart function. Did you know PET CT scan get affected by tattooed skin? Effects of tattoos during MRI are well known. MRI works on magnetic field theory. A tattoo containing iron traces will get induced during MRI and may cause a first or second-degree burn of the skin. However, the effect of a tattoo on the PET CT scan is different. No one wants a treatment to go in the wrong direction, therefore, one must provide complete details to his/ her doctor such as body parts where they have been inked, the aging of the tattoo and, if possible, the chemical present in the ink used. It has also been noticed by the doctors that there are cases where melanoma a type of skin cancer remained camouflaged for quite some time due to the presence of tattoos in body parts or areas of concern. 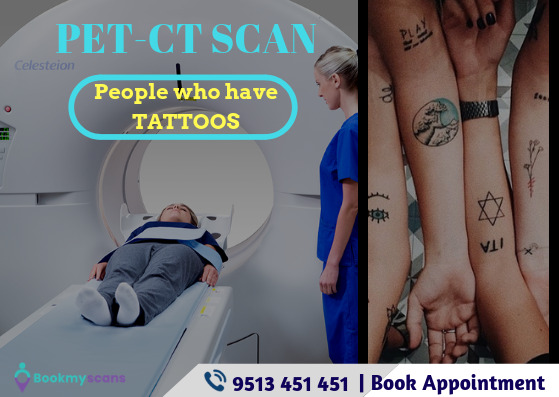 It is suggested that Lab technicians involved in the PET CT labs are made aware of the effects of tattoos on the scan result. They can map the locations and dimensions of the tattoo and can make a record of it on the observation sheet. Having said so, tattoos would seem much more appealing if its owner is cognizant and responsible. Something that is extremely essential is the practical execution of the theoretically known and fairly less implemented proverb, “The wise are cautious and avoid danger; fools plunge ahead with reckless confidence.” Or “The Cautious seldom errs”.